This light and highly maneuverable machine has a one-half horsepower motor and power channel construction enabling it to take up heavy adhesive residue, vinyl or VCT. The front-mounted 40° angle telescoping handle puts extra force behind, and extra pressure down on the blade. Collapses quickly for easy carrying. Comes with a No. 701 4" x 6" Vinyl Blade, No. 705 3" x 10" Multi-Purpose Blade, and the narrow No. 719 3½" x 3¾" Thin Spud Blade for tough take ups. All-steel frame and handle provides rigidity and durability. Variety of blades available for different jobsite conditions (see Crain Nos. 701-719). Net Weight 58 lbs. This hardened, high-carbon steel blade for Crain stripper machines has two 6" long sharpened edges. When one edge of the blade wears out, the other side is still usable, which doubles blade life. Its stubby 4" width produces a stiffer blade that performs well on sheet vinyl and VCT removal jobs. A sharp edge is ground to a 30° bevel on both sides. Works on Crain No. 700 or No. 710 stripper machines. Dimensions: 4" wide x 6" long x .079" thick. Net weight: 8 oz. This hardened, high-carbon steel blade has a 16" long sharpened edge. It is used mainly for removal of hard-setting adhesive residues. Its stubby 3" width produces a stiffer blade that works better in removing epoxy adhesive, thin set mortar, or cement-based patch. The sharp edge is ground to a 30° bevel on one side only. Works on Crain No. 700 or No. 710 stripper machines. Dimensions: 3" tall x 16" wide x .079" thick. Net weight: 14 oz. This heavy-duty extra-thick stripper blade is for removal of ceramic tile or wood floors. 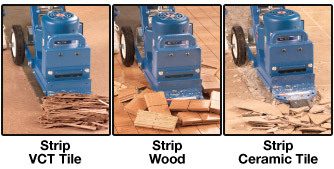 It has a narrow 3 1/8" wide sharpened edge for taking up narrow sections as is often required on wood floor takeup. The long 5 1/2" body provides extra reach to prevent the blade carrier from contacting the surrounding material. The sharp edge is ground on one of the 3 1/8" sides only. For use on the Crain No. 710 Power Stripper only. Dimensions: 5 1/2" long x 3 1/8" wide x 1/4" thick. Net weight: 1 lb. 2 oz.